Asian developer Euro Properties brings its luxury expertise to the states with its newest project, 118 E. 59th Street, a 40-story tower bringing 29 full-floor residences to Manhattan. Neo Que Yau. Founder & Chief Executive, Euro Group of Cos.
One trend creeping up in the real estate realm is international developers’ interest in building and investing in properties in major U.S. markets—and in New York City in particular. Euro Properties, a boutique property company that has its development origins in Asia, is getting in on the action with its current development of 118 East 59th St., a 40-story luxury condominium tower with 29 full-floor residences in the heart of Manhattan’s Plaza District. The company has 25 years of experience in the industry, specializing in prime residential and mixed-use projects primarily in Singapore and Hong Kong, but the Big Apple has been on Euro Properties’ mind for quite some time. 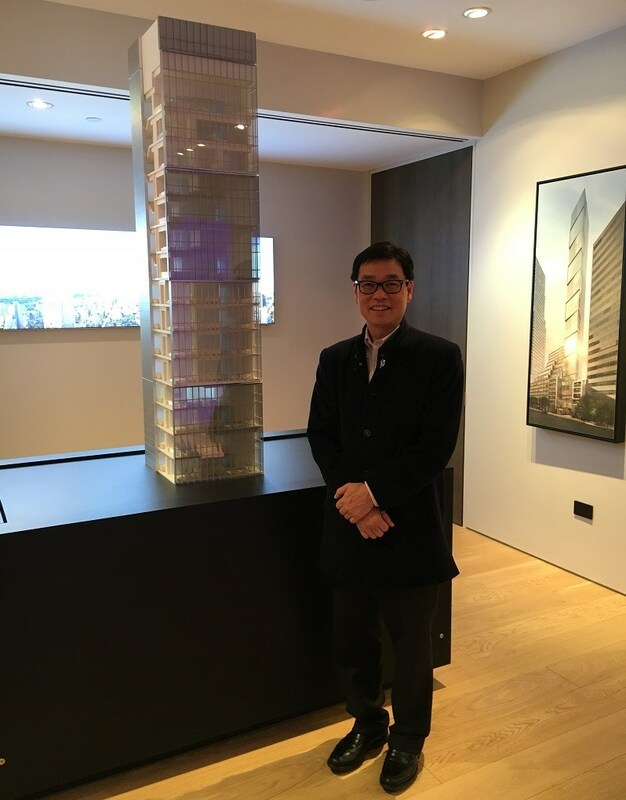 MHN got an exclusive look at the ins and outs of the property and sat down with Euro Properties’ Neo Que Yau to discuss the development. “Timing is very important and we’ve been looking at this market for a long time,” Neo, the founder & chief executive of Euro Group of Cos., told MHN. Euro Group is the parent company of Euro Properties and has four main lines of business: property investment & development; executive search & recruitment; events & marketing management; and asset management. The property is also conveniently situated near some of the city’s top luxury retail flagships, cultural destinations and high-end dining. Aside from this convenient location, the company also hopes to bring convenience into individual residences, and build a community with an exceptional design and high-end amenities. The company has enlisted Soo K. Chan of Singapore-based SCDA Architects to design the tower, which will rise 500 feet and feature dramatic glass-walled spaces in a lithe sculptural form. Neo described the building’s design as resembling the keys of a tape recorder. With each residence taking up a full floor, the one-, two- and three-bedroom units include 10- to 20-foot ceiling heights with a triplex penthouse occupying the top of the tower. In terms of design, SCDA will incorporate Asian culture by adding several water features, including a reflecting pond in the set-back, stone-floored lobby and a vertical water feature in the penthouse’s master bath. Building amenities take up two levels, giving residents access to an indoor/outdoor lounge with a fireplace, and a tranquility terrace with cabana-style seating on the third level, as well as a fitness center with a spa facility on the fourth level. Residents can also experience luxury living through an onsite concierge service from Abigail Michaels. The theme of offering residents convenient, comfortable living is most notably seen in the details put into the living spaces. Residences contain custom kitchen cabinetry with places fitted for plates, utensils and glasses, heated towel warmers and floors in the bathrooms, and walk-in closets by Studio Becker designed with built-in glass inserts for easy organization. The condos come in five floor plans, including: one bedrooms, two bedrooms, two bedrooms with a double-height great room, elevated duplexes and the three-story penthouse. Select upper-floor residences have Central Park views and home automation technology for easy control of lighting, shades, HVAC and security. Neo noted that putting in these details makes the move-in process especially easy for residents. “We want to make sure that the residences are built for [residents] to live comfortably, besides the convenience and the access, the comfort is really important, so we bring in the extra details,” he said. He added that having customized features allows residents to skip the lengthy application process of renovating a residence, which involves finding a contractor and going through the plans, and avoid having to wait possibly a year or two before a residence is move-in ready. Euro Properties has just begun pre-selling residences (prices start at $5 million) and is currently in the foundation stage of constructing the building. Brown Harris Stevens is marketing the property. For a closer look at the property, see MHN’s slideshow.